Wow ! - we were very pleased to find these ! Ancestralite is a brand new stone that is only just now beginning to reach the market. In fact, its so new we couldn't find out anything about it, nor anyone who has had any experience of it, nor anyone who had anything to say about it ! Luckily, Judy Hall is currently researching this new crystal and the following is what she has discovered so far and what she has to say about Ancestralite. 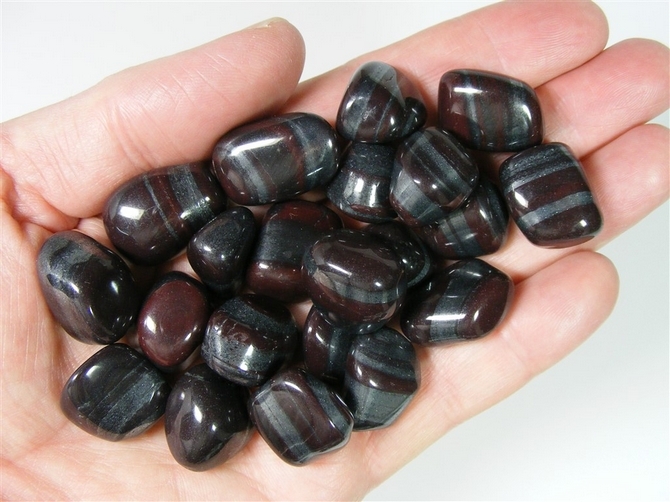 These are medium size tumble stones and we have hand picked each stone so that each one has a good mix of the deep maroon red along with the star sparkly Martite/Hematite. 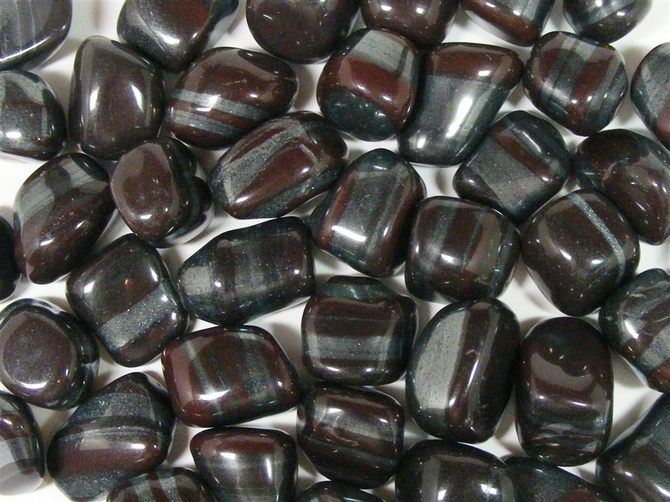 There are really not many tumbled stones of Ancestralite to be found out there. These are quite rare ! 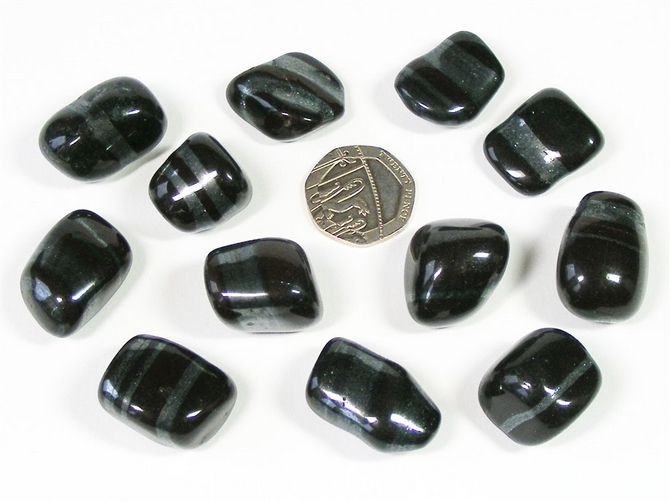 "Ancestralite is an amazing stone that helps us to reframe the past and heal the family tree. I'm still researching Ancestralite's full potential and will be for some time yet. This stone literally sinks down through the layers of the past to reach the core going right down to the racial and collective levels. It clears the ancestral line of trauma, dramas, ingrained emotions and imperatives that have passed down the family line for generations. At the same time, it preserves the soul learning and spiritual insights so that it can be incorporated into present and future actions and literally en-lighten the present and the generations to come. Ancestralite assists lineage breakers to cut the past, so that toxic karmas and attitudes do not carry forward into future generations. It says: 'the buck stops here. It's up to you so get on with it. Now!" It also cauterises the etheric body, clearing the imprint of that karma and its effect on the present life body. It is particularly useful when a parent needs to put down feeling overly responsible for a child who was ill or in any way disabled during childhood but who has now grown to adulthood. The stone assists in standing on your own two feet. In scrying, Ancestralite facilitates in accessing and reading the Akashic Records. But there is much more to learn about this most ancient of stones that connects past, present and future to the eternal now. Ancestralite was created from a stromatolite structure that oxygenated the atmosphere for a few hundred million years before other life was able to exist. But the presence of Martite (a Hematite pseudomorph of Magnetite) suggests that the rock got buried at a later date and underwent other chemical processes, as the process by which Martite forms happens in the earth's core. As can be seen from its sparkles and speckles, this stone has pure star material within it. It takes you back to before creation began. So this stone is a perfect example of the birth, death and rebirth process."